Product Junkie Diva: Not a Makeup Pro? 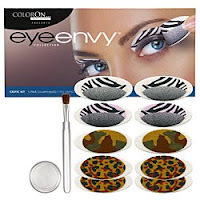 If you are not a makeup professional, but you would like to pull off an award winning look, you may want to try the new appliques called Eye Envy by ColorOn. This creamy mineral 100% hypo-allergenic eye shadow is a peal off product that can be rubbed on your eye lid to produce a variety of patterns. 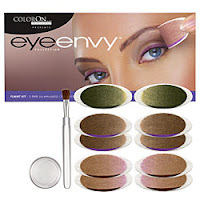 Eye envy claims to be a long wearing eye product that will not crease, leaving you with and expert makeup finish all day long. The kit pictured above is the Flaunt kit which I selected. When I first walked into Sephora yesterday and checked out this product I was set on the kit that I wanted to buy, but once I saw one of the colors applied to a woman's face I knew I had to make a switch because the palette would not have agreed with my complexion. I was in the store with a pal of mine whose complexion is much lighter and the product seemed to blend into her skin. Without any suggestions from us, the sales associate wiped the product from her lid and selected a new color. We liked the darker shade of brown but the remaining colors in the kit were not pretty so we both selected flaunt. Please watch the video to see how easy it is to apply my enviable eyes. (you really wont envy them after you see my application of the product). I forgot to mention that without the UDPP (Urban Decay Primer Potion) this product didn't last too long, the setting powder doesn't work well, but on the up side it didn't crease. Would you try this product or do you prefer traditional methods of makeup application? this product is clearly not for me. everyone has a different eye shape, for one. second, i like to experiment. some of my best looks are born out of "mistakes". I'd have to pass on this product. It's an interesting concept. Not for me though. I remember hearing about this months ago and being a bit apprehensive. Don't get me wrong, I am a huge eyeshadow lady but I don't think this would look good for my complexion either. But you review was amaziiiiing. Thanks sis! I don't wear eye shadow, but i would be willing to at least try this innovative product!! @Just_Wondering I know you are the eyeshadow queen girl. I think this box i was originally going to get may work for you it is called precious metals. You can see all of the colors if you go to the sephora website and search for the brand called ColorOn. @Amina instead of spending money see if a sephora associate can apply it for you for free, at least you will see if you like the colors. @Jewells...lol I am horrible at returns I need to take a page from your book. @Calming corners it was fun to play with. Diva, I was waaay more impressed with your presentation than the product - the choice of music, etc. The irony though it seems far easier to just apply shadow the traditional way to me. All this mixing solutions and whatnot is more complicated and time consuming than anything else. I know I won't get this again especially because it is cheaper to just buy the colors you like the regular way. I love your reviews, they are always so thorough. I think i am going to invest in that aveda line, it hasnt let me down this far! that eyeshadow scared me until you blended it, it wasnt bad at all! @Justme thanks so much for your kind words. Yes I like Aveda also I recently purchased some Aveda skincare stuff which seems great so far.